Everyone wants a phone that’s both bigger and smaller. If we’ve seen one trend in the 2010s, it’s bigger screens on thinner phones. No one wants a half-pound phone and yet they want a screen that they can read. The solution: Take almost everything out of the phone but the screen and the battery. Don’t believe me? Phones used to have headphone jacks. They used to have home buttons. They used to have actual number pads where you would push numbers to dial. Heck, they used to have physical keyboards. All those things are gone now and replaced with one big screen. I’m not complaining. It’s just how things are today. Can we remove anything else? The next choice for removal would be the SIM card. Before we bid farewell to the SIM, let’s talk about its long history. 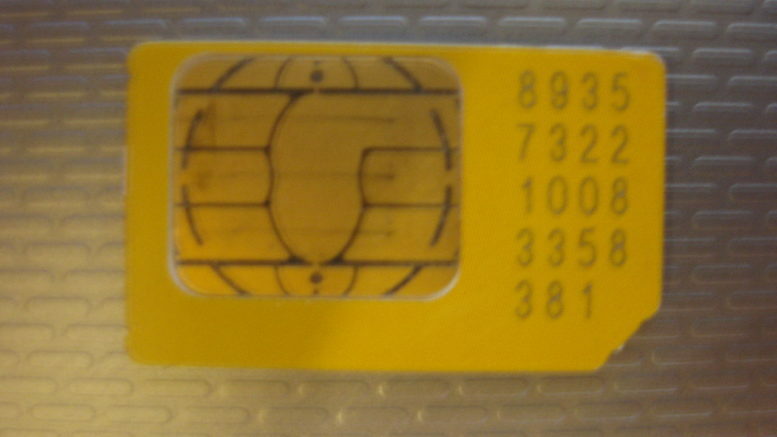 The SIM, originally called a “subscriber identity module” was developed in the very early 1990s in Europe. Unlike the US, Europe has always had one cellular standard and it’s practically impossible to get a free phone there. So, even back then everyone paid full price for a phone and then went to whichever carrier they wanted. The goal was to create a way for people to change carriers as much as they wanted. In Europe, even the Europe of the late 20th century, people went from country to country far more often and since they didn’t want to pay roaming charges, they wanted a way to use the local country’s cell service. By creating a “card,” in reality a small piece of computer board, that held all the important information about a phone, it became possible to bop from carrier to carrier easily. The SIM card started to make its way to the US in the very late 20th century as digital cell service became the norm. GSM, the standard used in Europe, also made an appearance here in the US as one of the competing standards. Part of the GSM standard is the use of the SIM card, so SIM cards came to the US. Keep in mind there wasn’t much reason for them even then. People couldn’t really change carriers since the phones were locked down and every carrier used different technologies. But SIM cards were there anyway. Phones from Verizon, Sprint, and other non-GSM carriers never had SIM cards until very recently. Mobile internet became incredibly important in the 2010s and the key was LTE. LTE is actually an advanced implementation of GSM, so even if the voice part of the phone didn’t work with GSM, the data part would. This led to some interesting contradictions. By 2015, the Verizon version of the iPhone supported LTE. That means it had a SIM card which was used for data only. It also meant that you could bring a Verizon phone to AT&T and activate it — because it had all the hardware to make AT&T’s service work. You couldn’t, however, bring an AT&T phone over to Verizon because … it didn’t have what it takes. Today virtually every phone has a SIM card and so does every cell-enabled tablet and computer. Because LTE is the one unquestioned standard (until 5G comes along) every phone has it. Which means, of course, that it’s time for it to be taken away. With good cellular data service nearly everywhere, there’s very little reason for a physical SIM. It’s just as easy to have the same information built into the phone, so long as you can change it by sending a code to the phone. That’s why the eSIM was born. The eSIM is just the same programming as a SIM card, just built into the phone. It contains the same information, and it’s just as easy to change if you want. With the right app you could change your own information, at least the part where your phone is being billed by the right people. Of course there are some protections in place to make sure the phone’s unique serial numbers can’t change. It would also be extremely easy to bring any phone to any carrier and activate it, as long as the phone was designed for it. Today’s iPhone X for example, is finally one phone for every US carrier and you could very easily walk into another carrier’s store and change the activation. iPhone X, however, still has a physical SIM. It’s a nano-SIM, about one quarter inch in size, but it’s still a physical thing. On the other hand, Apple’s iPads now have support for eSIM. For old school types they still have a physical SIM slot. If you had a data plan with your old iPad you can still pop the card in a new iPad and it will work. More importantly though, you don’t have to. Like iPhone X, iPad is now one version for all carriers and you can activate it any way (and anywhere) you want thanks to eSIM. Even at its current size, SIM cards take up too much space. They need a big slot to fit into and every millimeter on a phone is precious. An eSIM could be about the size of a grain of sand and still work. That would free up a lot more space on a phone for a battery, which is pretty much the only part of phone that hasn’t gotten smaller or more advanced. I think this is a great idea for the majority of people. I personally only deal with a SIM card when I get the phone or when I sell it. Otherwise I don’t think about it. Getting rid of the physical card will make it easier for my next phone to be the size I want to be. It will also make it easier to waterproof the phone and that’s getting more and more important. Should carriers fear the eSIM? I would say no. I get it though. With no 2-year contracts and no little physical cards to worry about, people could jump to a new carrier easily. However, people could do this now and the fact is they don’t. Why? Because people get loyal and they don’t want to think about it from month to month. They also buy their phones on installment plans and don’t want to pay the full amount due. So I would say, carriers shouldn’t fear the eSIM. That’s a good thing too, because I have a feeling that we’ll see eSIMs in pretty much every phone in the next few years. In the meantime, whether you have the latest or oldest phone, you can tune up your cell service with a call to Solid Signal. We’re an AT&T dealer and can get you all set up. The number you need to know is 877.312.4547.